Stanford is one of the world’s leading teaching and research universities. Located in Stanford, California (population 16,914), Stanford University’s campus neighbors the city of Palo Alto (population 67,024). Downtown is only a short walk from campus and includes shops, restaurants, and more. 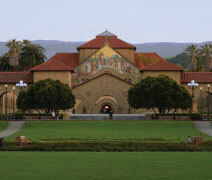 Stanford is also located 20 miles north of San Jose and 35 miles south of San Francisco. To the west of the campus are the Santa Cruz Mountains and the Pacific Ocean and to the east is San Francisco Bay. Financial Aid: Stanford has a limited amount of financial aid for international students. International students needing assistance must make that indication on the admission application. Aid eligibility will be determined based on family financial circumstances. International students who do not request consideration for financial aid at the time they apply for admission will not be eligible to apply for aid at Stanford throughout their undergraduate years. In order to receive University scholarship funds, international students must obtain either a Social Security Number (SSN) or an Individual Taxpayer Identification Number (ITIN). Stanford’s Bechtel International Center offers information on their website about obtaining an SSN or ITIN. Test Score Requirements: The SAT or the ACT is required for all undergraduate applicants. If no sittings of these tests are offered in your country, you may request a testing waiver. The request must be submitted by a school official in writing by email (credentials@stanford.edu), mail, or fax (+1-650-723-6050). Include your full legal name, school name, and date of birth at the top of the letter. No form is required. Requests will be reviewed on a case-by-case basis. The Test of English as a Foreign Language (TOEFL), although not required, is strongly recommended for non-native speakers of English. You may submit your IELTS scores, but note that Stanford does not recognize the IELTS as a measure of English proficiency. APplication deadlines and fees: Fall term deadline: January 2; applicant must accept offer by May 1. It is known for its innovative academics, rich diversity,entrepreneurial character, and relationship to Silicon Valley. With areas of excellence ranging from the humanities to social sciences to engineering, Stanford is dedicated to finding solutions to big challenges and preparing students for leadership in a complex world. A Stanford undergraduate education is rigorous and defined by the inherent freedom and flexibility enjoyed by students as they delve into the subjectsabout which they are most passionate—forging meaningful relationshipswith their talented peers and lauded faculty along the way. Grounded in the liberal arts, the Stanford curriculum is designed to achieve balance between depth of knowledge acquired through specialization and breadth of knowledge gained through exploration. It permits each student to plan an individual program of study that takes into account personal educational goals, prior experience, and future aims. And it is an education that broadens the student’s understanding and awareness in each of the major areas of the human experience, significantly deepens understanding, and prepares him or her for a lifetime of continual learning. Many students supplement this already robust education with high-level research, even as undergraduates. In fact, Stanford has more funding available for undergraduate research—more than $5.6 million per year—than most colleges or universities in the nation. Students usually write proposals (with advice from faculty sponsors) to have their projects funded, which can cover expenses such as travel and equipment and allows students to devote their full attention to their research. Stanford students and faculty come to campus from a vast range of backgrounds and all over the world. Undergraduates represent all 50 states, and 12% are international; approximately 17% are the first in their family to attend college. But diversity at Stanford means more than geographic, racial, or ethnic differences. The Stanford community embraces a wide array of socioeconomic, religious, cultural, and educational experiences. From the vibrant residential environment to intellectually charged classrooms to every corner of campus where students engage, diversity is celebrated. The Stanford community values a wide range of opinions, cultures, communities, perspectives, and experiences, all of which challenge a student’s own beliefs, intellectual passions, opinions, and understanding of the world. 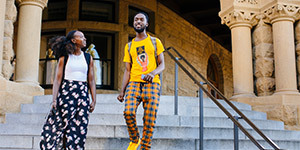 Members of the Stanford community believe the best education can develop only in a community that actively affirms both the differences among its members and the numerous points of connection. Just down the road from campus is the global epicenter of high technology: Silicon Valley. From HP and Google to Netflix and Pandora, many of the most innovative enterprisesin modern history were sparked by Stanford faculty, alumni, and students. However, entrepreneurism atStanford extends far beyond founding companies; Stanford’s entrepreneurial spirit is homegrown, organic, and pervasive. Students, faculty, andalumni generate transformative ideas and set them in motion. One such idea incubator is the Haas Center for Public Service, which connects academic study with public service to strengthen communities and develop effective public leaders. Recognized as a national model for public service education, the Center encourages Stanford students to impact their community through service, scholarship, andcommunity partnerships. More than a third of undergraduates participatein one or more Haas Center programeach year, from working with organic farmers through the on-campus Stanford Community Farm to helping children develop language and literacy skills in East Palo Alto’s publicschools. Another is the experience in learning known as “CS+X”—a joint major integrating Computer Science with the humanities launched in fall 2014. Its goal is to give Stanford students the chance to become both a new type of engineer and a new type of humanist. Located in California’s intellectuallydynamic and culturally diverse Bay Area, Stanford is a thriving residential campus and community sitting on8,180 pastoral acres, once a horse farmbelonging to Jane and Leland Stanfordand still fondly referred to as “the Farm.” Today 60% of that land remains open space, including some 43,000 trees, three lakes, and rolling foothills that overlook the inner campus. On the campus itself, designed byfamed landscape architect Frederick Law Olmsted and bustling with bicycles, skateboards, rollerblades, motor scooters, and golf carts, you will find California Mission–inspired buildings of local sandstone with iconic red-tiled roofs and a cloistered quadrangle with Memorial Church as its focus. More than 12,500 students live onthese sprawling yet intimate grounds,surrounded by extraordinary campus resources and facilities. And with San Francisco only 35 miles to the north, San Jose 20 miles south, and Palo Alto right next door, students enjoy a regionrich not only in opportunity but in entertainment and other diversions. With its culture of creativity and innovation, Stanford fosters an arts scene alive with professional and student voices, from film archives to orchestral concerts to visiting Broadway legends—not to mention a collection of visual arts pieces that spans 4,000 years. For the student-athlete driven to excellence, Stanford fields 36 varsity teams and 32 club sports. Stanford has won the Directors’ Cup, which honors the most successful program in NCAA Division I sports, for the last 24 years. And for 42 years in a row, Stanford has won at least one national championship—the longest streak in the nation. In addition to the offerings on campus, the Bing Overseas Studies Program (BOSP) is considered an integral part of Stanford’s curriculum. Approximately 51% of each graduating class studies abroad during their undergraduate career at Stanford, and BOSPoperates a variety of programs—including international internships—at locales such as Cape Town, Florence, Kyoto, Paris, and Santiago. Stanford is committed to a need-blind admission policy for US citizens and eligible non-citizens and to providing a comprehensive financial aid program for all admitted students demonstrating need. Stanford assesses undocumented and DACA students under the same need-blind admission policy it uses for US citizens and permanent residents, meaning applying for financial aid is not a factor in making admission decisions. While undocumented and DACA students are not eligible for federal financial aid, Stanford uses institutional funds to meet the full demonstrated need of all admitted undocumented students. In recent years, about 67% of undergraduates received financial support from a variety of internal and external sources (financialaid.stanford.edu).